To celebrate 21 years of my SMS Creative studio, I have picked my five favourite shots. It was a difficult task, so here goes! Girls in front of String Quartet. I took this photograph at a wedding in 1999 of a little girl who was running around until she came across this wonderful string quartet where she stood mesmerised, giving me the perfect photo opportunity. Husband and wife on Mother’s Day. I was commissioned by this couple’s daughter to make a surprise appearance at a family gathering on Mother’s Day five years ago. I just love this photograph because it shows a wonderful moment between husband and wife in their garden - their expressions say it all. These twin sisters I photographed in 1998, aged four, were so close and their unique understanding of each other comes through so clearly in this image to make it a beautiful expression of their partnership. Little girl behind the flowers. I photographed this adorable little girl in 2016 with her three brothers at home in their garden with beautiful spring flowers. After photographing her with her brothers we had a little walk around the garden. This photograph wasn’t posed, she just peeked through the flowers and this is the result! I loved it from the moment I clicked the shutter. The Queens Golden Jubilee June 2012. This photograph outside Buckingham Palace was the result of me waiting amongst the crowds for over three hours on the Mall for the Royal procession to catch a precious glimpse of the Royals. After the procession, I was jostled along with the crowd and found myself in prime position to take this photograph, at the same time as a Red Arrows Fly Past! On the balcony are the Queen, Prince William, Kate, Prince Charles, Camilla and Prince Harry. 2017 was a year full of surprises for me at SMS Creative Photography. 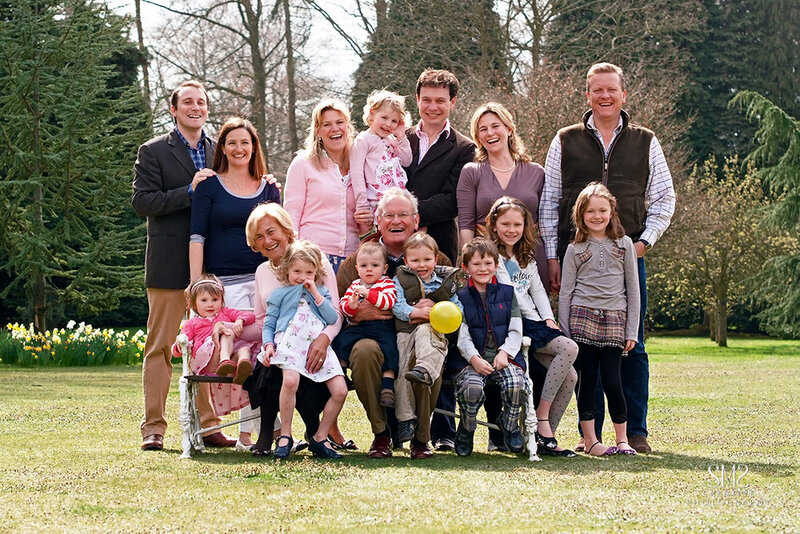 Alongside the many portraits I captured in my studio on Oxted high street, I was also privileged to be invited into the lives of many wonderful families, to document their treasured moments, in a setting special to them. As I look back, the photoshoots that stick in my mind are; beautiful twin girls against a backdrop of magnificent bluebell woods, a teenage girl in a stunning woodland setting with Pre-Raphaelite inspiration and a lively day with three generations of the same family. I am proud to say I have been working with this family since I first started my business almost 21 years ago! It has been a joy to see them thrive during this time, and it gives me such satisfaction to preserve their memories for future generations to enjoy. If 2017 was a year that was rewarding professionally, it was also memorable for my family. On the Friday before Christmas, my son arrived for a surprise visit from Australia! It was truly the best present any mother could receive. Looking ahead, I am now excited by what 2018 will bring. I have many plans afoot, some which I can share with you now. Location photo-shoots are always popular, any time of year, now that we are coming to the end of a very chilly winter and the longer spring warmer days are on the horizon the diary is filling up. Photographing in the studio is predictable, as light and backgrounds can be controlled. However I always like the challenge of family locations photo-shoots as I never know quite what to expect regarding the lighting and the choice of backdrop. Just before Christmas I went to a particularly inviting location, a stunning house and garden to match, to photograph 3 teenage girls with their lovely mum. It wasn't the garden or the house I chose to photograph in, as I wandered down the garden I found their greenhouse to be a hidden gem. The early morning light was just right and I think you'll agree the interior is charming, with an English country garden feel, I just couldn't resist! I used a gold reflector to fill in the shadows on their faces which worked a treat. The mix of burnished copper leaves and dark pink flowers worked perfectly with the monochrome colours the family wore. I'm finding family locations photo-shoots popular as gift vouchers for Mother's Day, special birthdays - especially grandparents with their children and grandchildren, this link to our website shows you more. we are now exploring the 'Viewing Session and Choosing What's Best For You'. A week or so after your location shoot you are invited into the comfort of our studio for a presentation of the photographs. An hour is set aside to go through the images to select your favourites, don't worry I have already done the first edit. A number of images are shown on the screen so a comparison can be made and shuffled into different folders of preference. The images below give an idea of what to expect. Depending on how you choose to display your photographs, either for yourself or as a gift, different layouts, papers, glass, frames and acrylic finishes are suggested to suit you. The above is all done prior to skilled in-house post production, which will feature in Part Five - 'Editing and Post Production'. and there is a variety of frames to choose from. Please join me in two weeks time to learn a little more about the process 'From Camera to Wall'.